Whether you are just starting out in watercolor or you have been painting for a while, it never hurts to take some time and make yourself a color wheel. A color wheel for the beginner is necessary to understand the relationship of the three primaries - red, blue, and yellow and all of the colors that can be made from them. 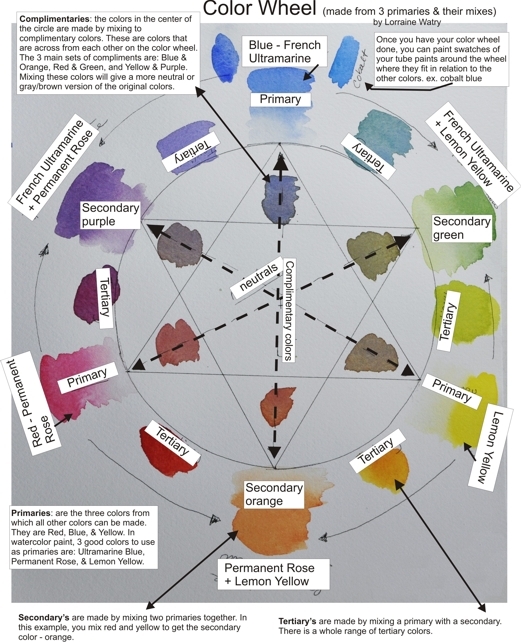 For the more advanced watercolor student, the color wheel can help remind you that there are many more colors to be made than just the ones you have on your palette. Here is the nitty-gritty of any color wheel. Primaries: There are 3 colors that all other colors can be made from. They are Red, Blue, & Yellow. Secondaries: There are three secondaries. Secondaries are made by mixing two of the primaries together. Red & Blue make purple, Yellow & Red make orange, and Yellow & Blue make green. Tertiaries: These colors are made by mixing a secondary color and a primary color together. For example: Yellow and orange make a yellow-orange. There can be many many tertiary colors. Complimentary Colors: These are the colors that sit across from each other on the color wheel. There are 3 sets of complimentary colors. They are Blue & orange, Red & green, and Yellow & purple. By mixing the two complimentary colors together you get a more neutral or grayed down mix. These neutral colors can be wonderful colors in a painting and can make great grays and browns that have some life about them. The color wheel you see in this post was painted by me with three primaries: French Ultramarine, Permanent Rose, and Lemon Yellow. Please feel free to print this image so that you can use it to do your own color wheel. For the more advanced watercolor student - this watercolor wheel was done using 3 "cool" primaries, but it can also be done using 3 "warm" primaries. Three colors that are considered "warm" primaries would be Phthalo Blue, Winsor Red (same as Pyrro Red - Daniel Smith or Permanent Red - Daler Rowney), and New Gamboge Yellow. However, I don't care for the "warm" primaries color wheel. You will get less vibrant colors. Also, definitely try some complimentary mixes and see all the wonderful neutral colors you can make. Thanks again Lori for this very interesting and informative chart. With all of the colors on our palettes, I forget how many colors can be achieved by using only three primaries. I do get confused with the "warm" and the "cool" colors though. This was a good reminder. Thanks for sharing. Thank you, Lori, this will be a great exercise as I'm just starting out with painting and watercolors.